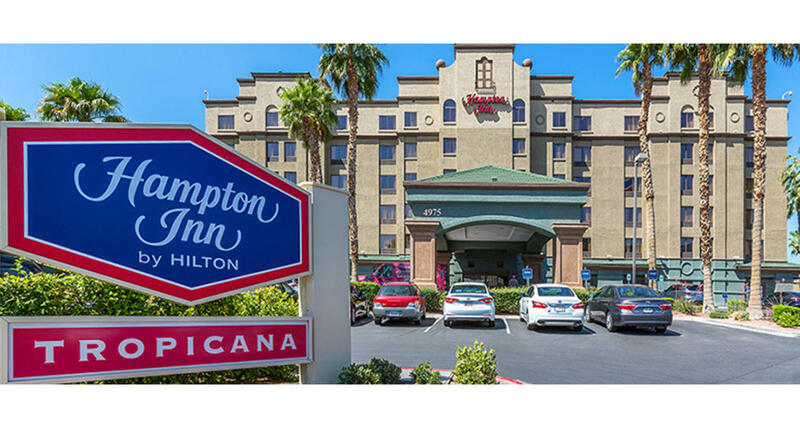 Hampton Inn Tropicana Hotel near I-15 is a wonderful choice for business, group, leisure, and international travelers seeking value for their Las Vegas hotel accommodations. The family-friendly hotel is conveniently located a half mile (walking distance) from the excitement of the Las Vegas Strip, and just minutes away from McCarran International Airport. Forget about paying expensive cab fares, Hampton Inn Tropicana provides complimentary shuttle service to the airport and the Strip. Guests can enjoy all that Las Vegas has to offer right from the hotel including the endless shopping, sports, gaming and live shows -- you'll find something for everyone. Great dining is also a short walk from the hotel. This comfortable hotel features more than 300 deluxe guest rooms and 5 spacious suites, and 8,400 square feet of meeting space, giving guests the space they need to enjoy a relaxing vacation, host a meeting, or get down to business. Don't forget to enjoy the year-round outdoor heated pool, spa and cabanas, 24-hour fitness center, complimentary breakfast, wired & wireless Internet, self parking and HDTVs. With a prime location, budget-friendly accommodations, and rewarding amenities, Hampton Inn Tropicana is a great options in town.